1. Mix the oats with the milk and stir well. 2. 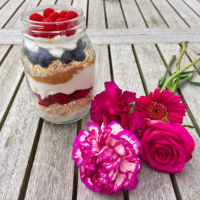 Choose a bowl or container and layer the oats, yoghurt and fruit. 3. Leave in the fridge over night and enjoy cold in the morning!